Creating anything for boys or men in your life is super tough. I've made ONE thing for Matt ever before. Ha. This makes two things in 3+ years. This is an easy idea, though that everyone can enjoy...a backyard hammock! 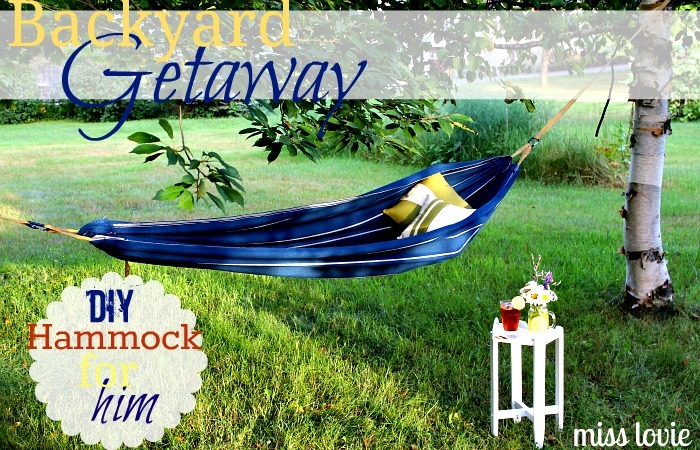 Hammocks are surprisingly SO easy to make so this sweet little getaway would be really simple to do! He can go just a few steps out our door and have a super comfy place to just relax. You could even attach some hooks to your walls indoors and bring this getaway idea inside if you wanted to! 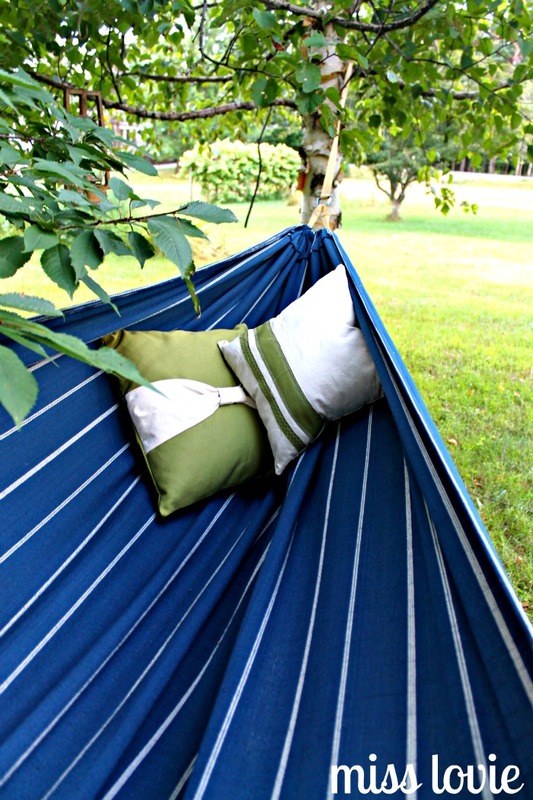 I used some nice home decor fabric to make the hammock because it was strong while also soft, and it was two-sided! I made some tree straps to attach the hammock to trees. 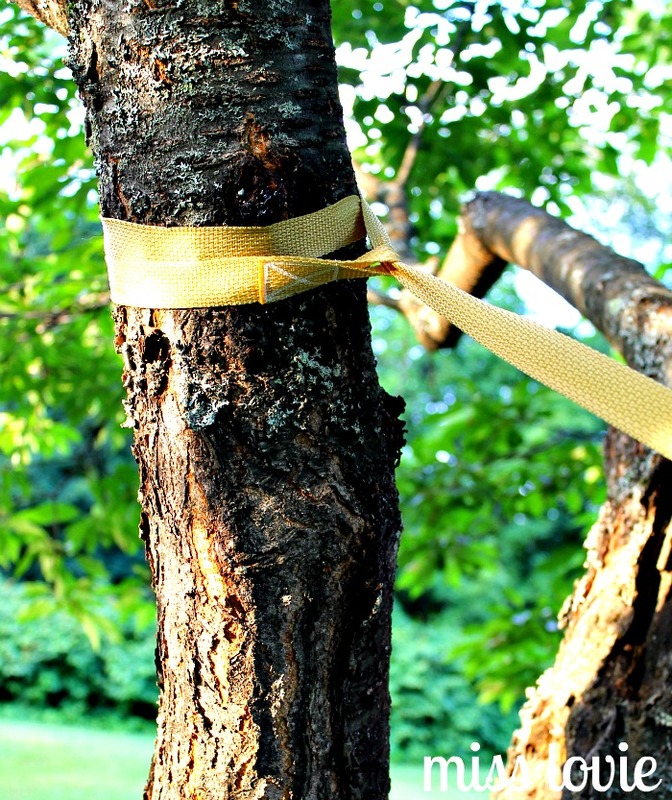 They're extra long so you can attach them to the thinner trees like in this yard by wrapping the strap around the trunks a couple times or just once around larger trees. And look how wide it is!! Perfect. 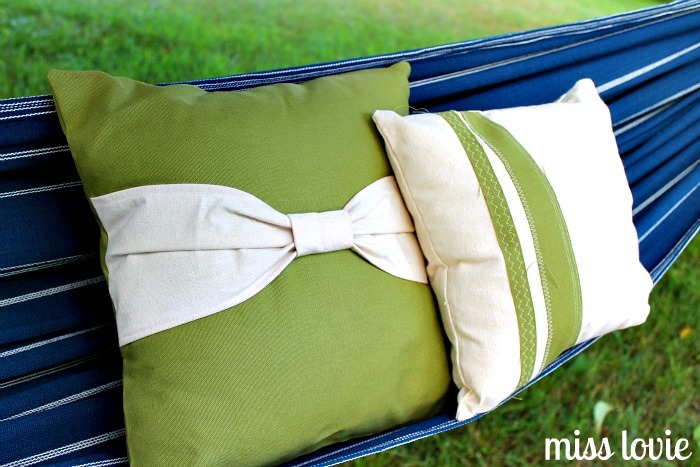 The pillows are made out of sturdy duck canvas. They're not really needed since the hammock is pretty comfy as is, but I thought they were a nice addition, just for fun. Here you can see the tree straps a little closer and the gathered ends of the hammock. I made four tree straps. Two for wrapping around the trees about 10 feet long and then 2 that were 2 feet long that were used to thread through the ends of the hammock so the hammock would gather. Here's how the tree straps were attached to the tree. Simply loop the strap around the tree (a few times if the tree is thin like this one) and then slip one end through the loop on the other end of the tree strap and pull tight. If you want to make one here's a few more details! 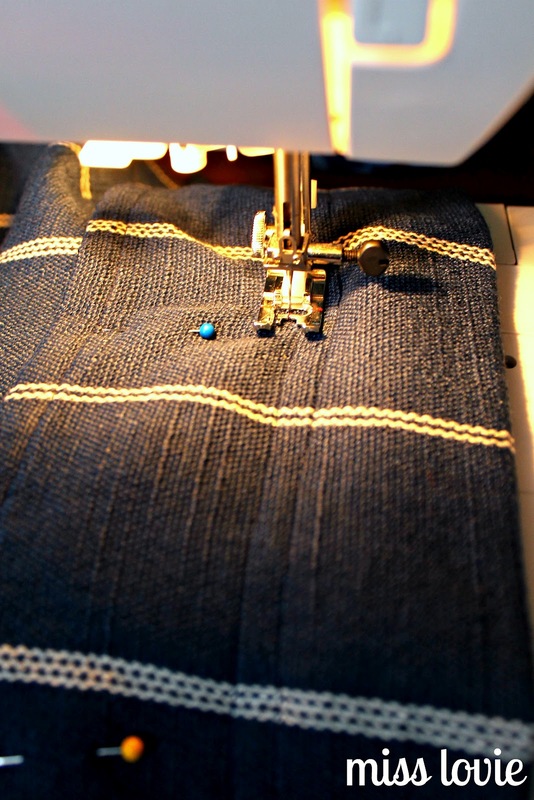 You will use the whole length and width of your three yards of fabric. Mine was almost 60 inches wide. Hem all edges of your fabric. 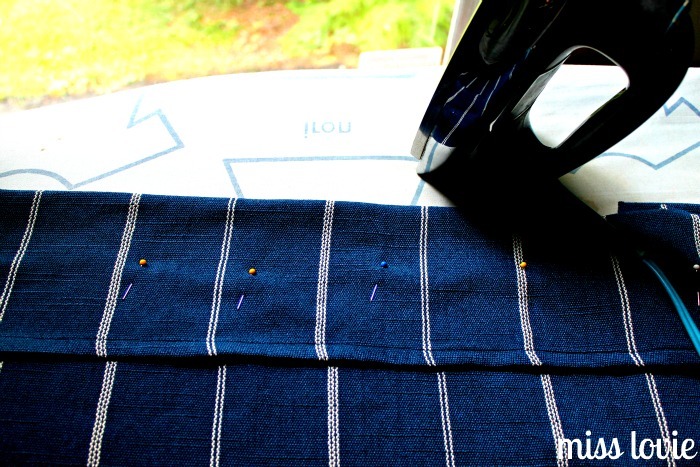 Then fold over the short ends of your fabric 5 inches, press and pin. You will sew several lines on this fold to reinforce its strength. Sew the first line across about 1 1/2 inches from the folded edge. As you sew, move your pins down so that they're already in place to sew your next line. 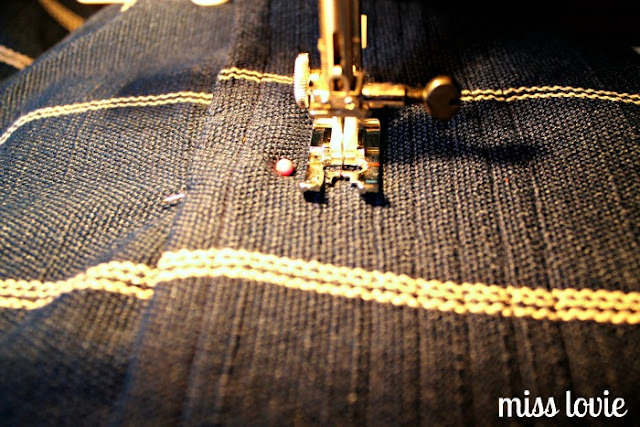 Line the edge of your foot up with the last line you sewed in order to keep your lines straight and at an appropriate width away from the last line you sewed. I sewed about 7 lines on each end. 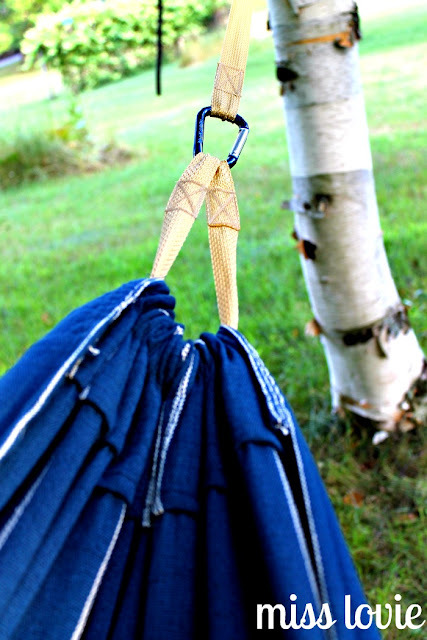 For each tree strap you will create loops like these above sewn down by sewing a boxed-in X. First cut the webbing into four pieces: for the short straps that are threaded through the ends of the hammock, cut two pieces about 2 feet long. For the long tree straps, cut the rest of webbing you have left in half. For each tree strap you make you will create loops on each end. 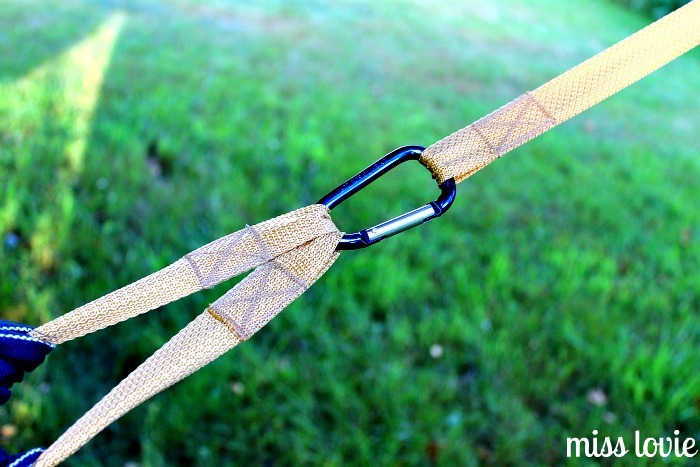 To create the loop, fold the webbing over itself so that the loop is folded over 3 inches. 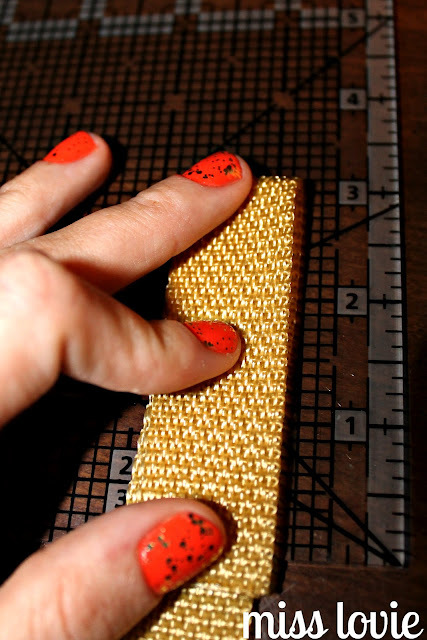 Start sewing your box 1 1/2 inches down from the folded edge and all the way to the end. I used this Sewing Tree Straps video to make sure they were strong enough. Basically you just sew a ton of lines on each box and X. And that is seriously it for all of it. 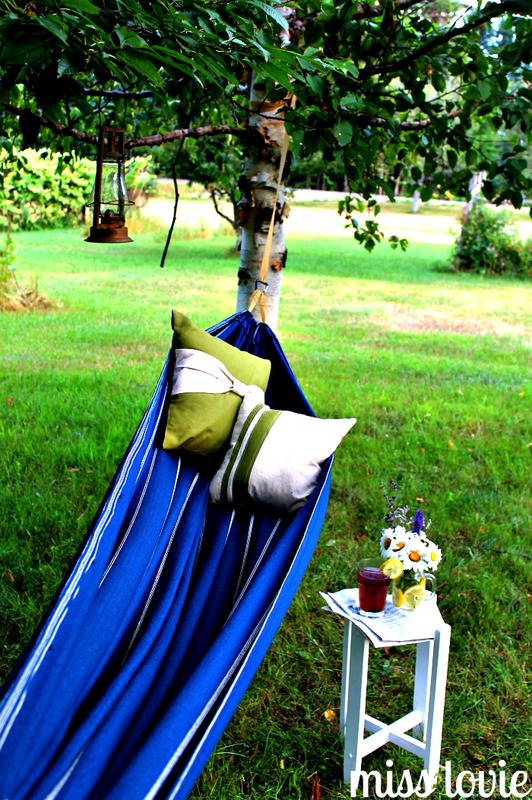 Follow the pictures and directions above to hang it and relax! If any of this didn't make sense, please let me know! 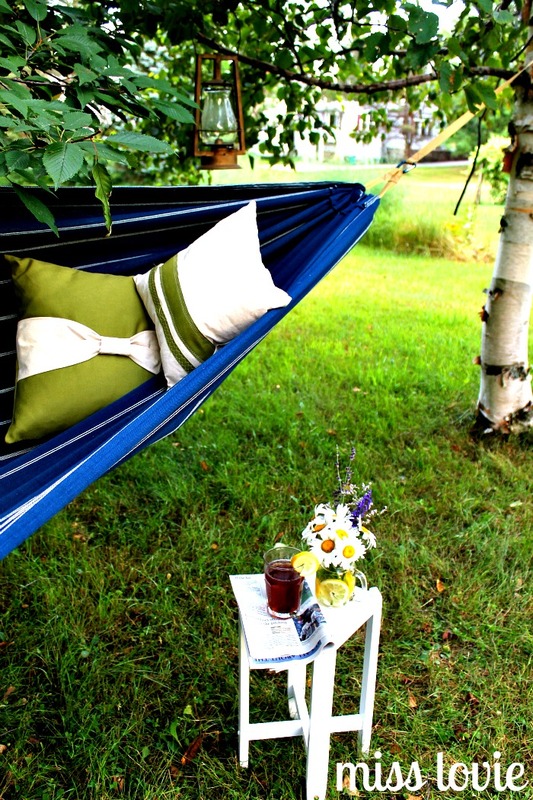 :) Enjoy your new easy hammock! It's definitely already a favorite spot at our house! Hope you love it!! Thanks to everyone who voted on So You Think You're Crafty last week! 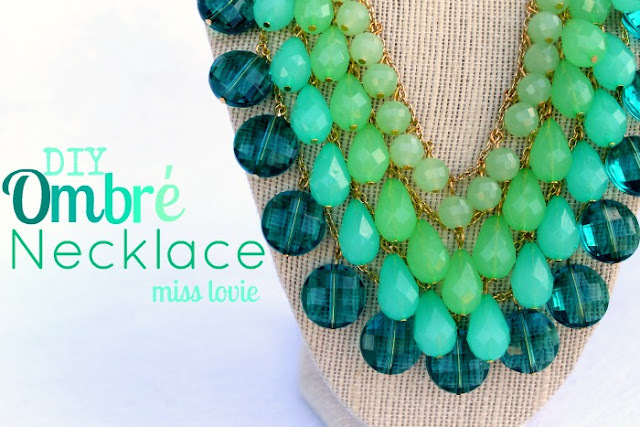 My Ombre Necklace ended up in 2nd place! Here it is -and a tutorial!-if you didn't see it last week! I'd love love for you to go on over and vote for your favorite "Let's Hear it for the Boys" craft! Voting ends Thursday and it's a close race right now! The Ombre trend is so fun right now. I love it on anything-furniture, home decor, desserts... hair! 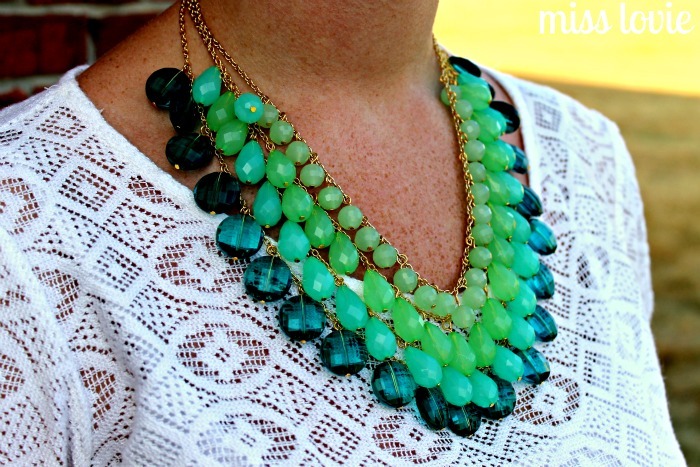 What about on jewelry?! I love the idea of it making a statement with your accessories without being too over the top. 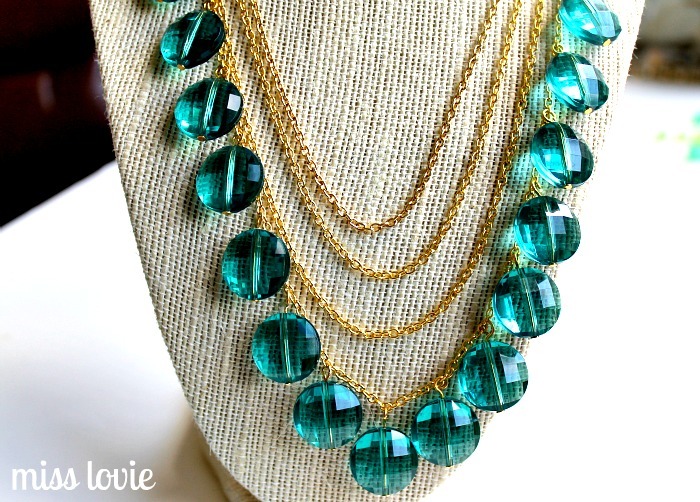 I thought this Ombre Necklace was a great way to do just that. 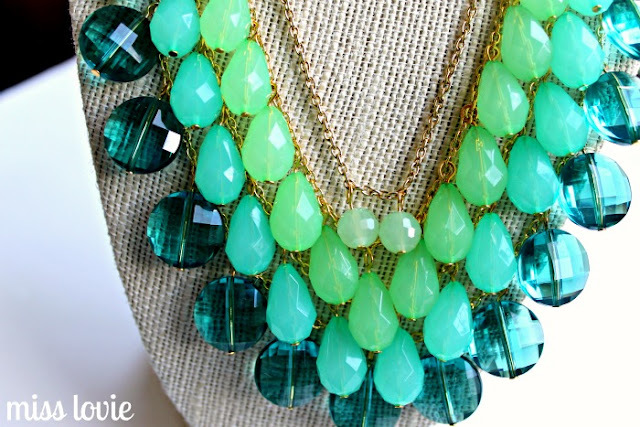 Since Ombre is such a trend right now in the crafting world, I really love it, but I also know it may not be around forever. I wanted to create something that would withstand the trend. The colors are so pretty and really pop against that white top. 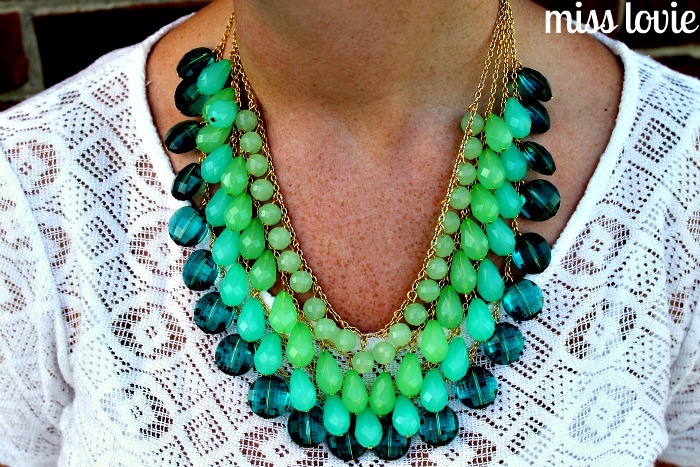 I think the necklace would be really great with a fancy dress or a simple t-shirt and jeans. Want to make your own? It's really pretty easy. Let's do it. 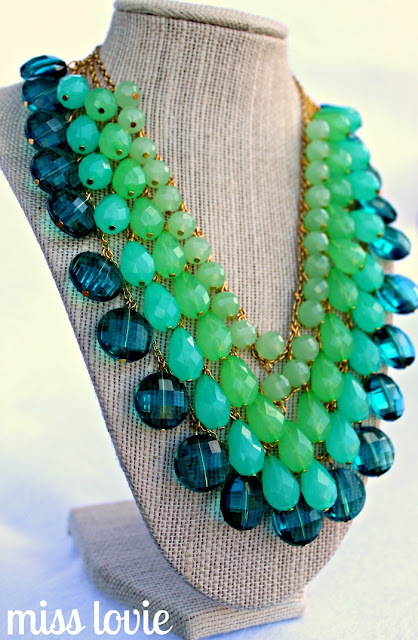 First, create simple loops with all beads and head pins. 1. 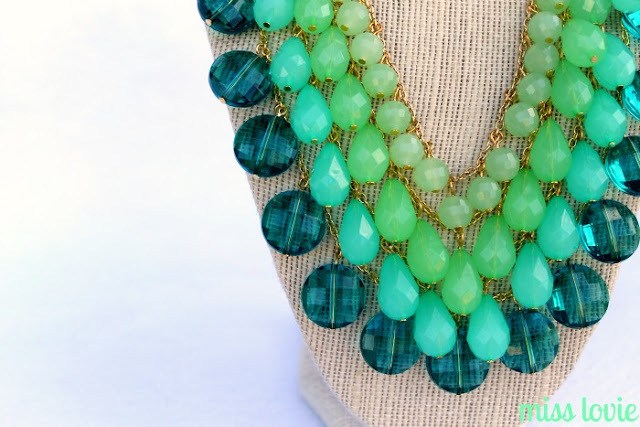 Place your bead on your pin 2. 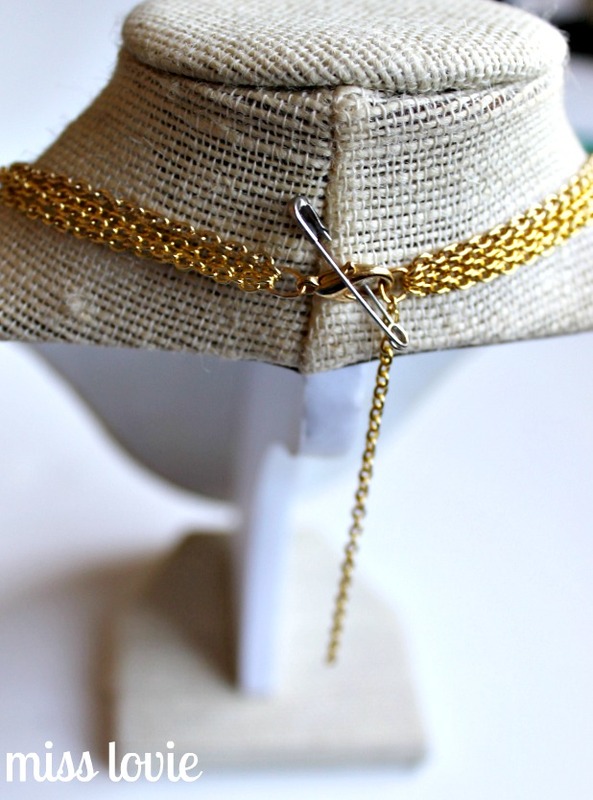 Bend the wire at a 90 degree angle over the bead. 3. Place your needle nose pliers above the angled wire and bend the wire over the needle nose as seen here and in step 4 below. 4. As explained in step 3, bend the wire around the needle nose. 5. 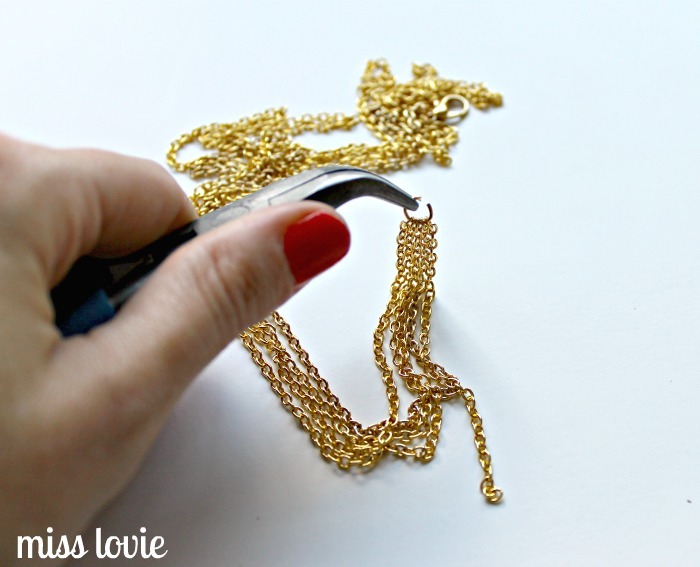 Reposition your pliers so you can continue to wrap the wire around the needle nose so that the wire creates a circle. 7. Use your wire cutters to trim off the excess wire. Next, cut and attach chain. Cut chains into 4 pieces in graduated lengths: 20 inches, 18 inces, 16 inches, and 15 inches (I did 15 instead of 14 because the beads I'm using on that chain are smaller. If yours are the same size as the others, then you can make it two inches shorter as well). Then place the chains on an opened jump ring, longest to shortest and add the clasp. Close jump ring. Keep chains straight and put the other ends onto the other jump ring. If you want the necklace to be adjustable, you can add a short length of chain on here too. Close the jump ring. Here's the chains all ready. 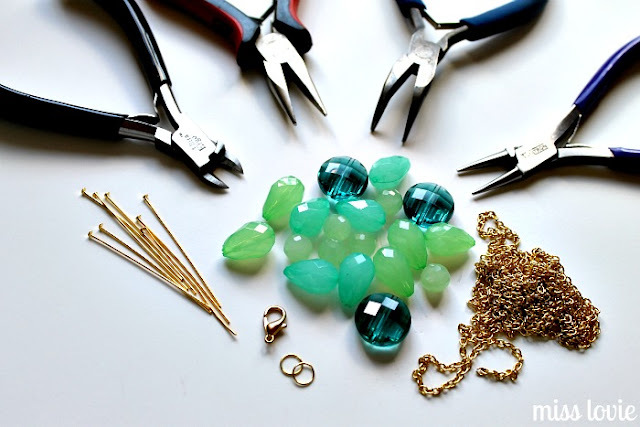 To attach the beads open up the simple loop of each bead by simply using your round nose pliers and pulling the loop apart. Hook it into the chain and then close the loop again. 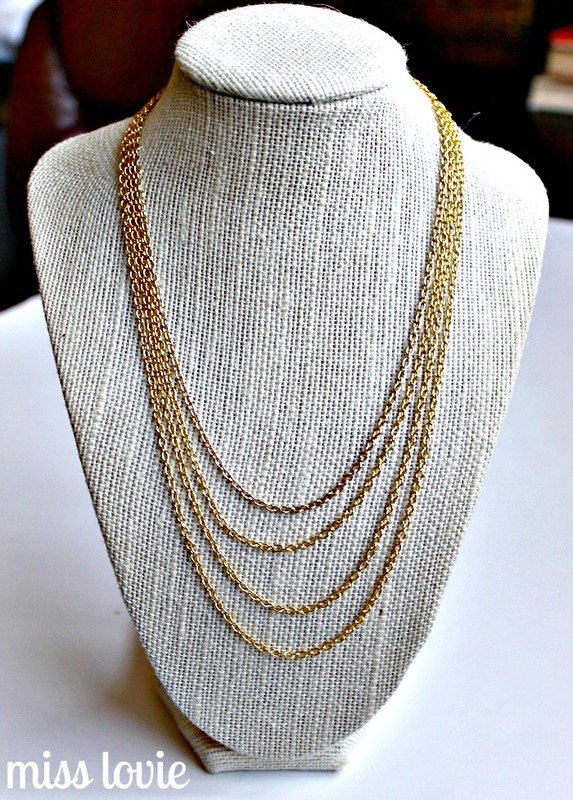 Start with the bottom/longest chain and work your way up. 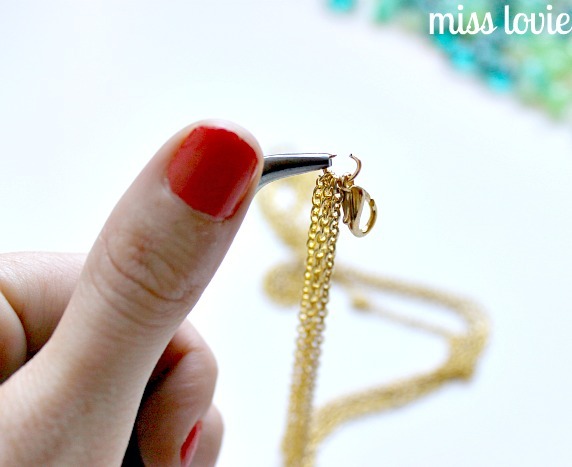 Find the center of the chain and put the first bead there. 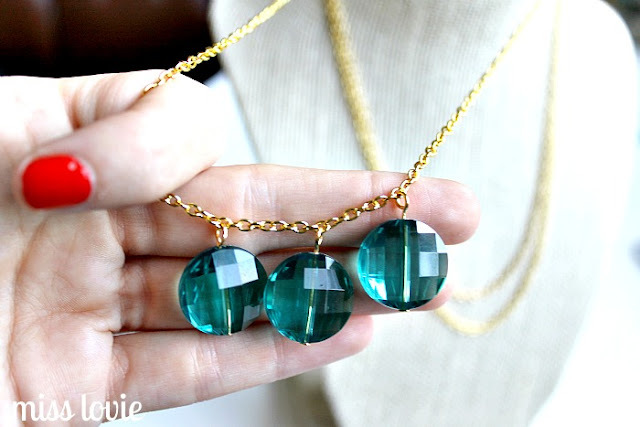 Then space them evenly outwards from that center bead. You can measure using a ruler if you like to make sure beads are evenly spaced, but I found it easier to count links in the chain. 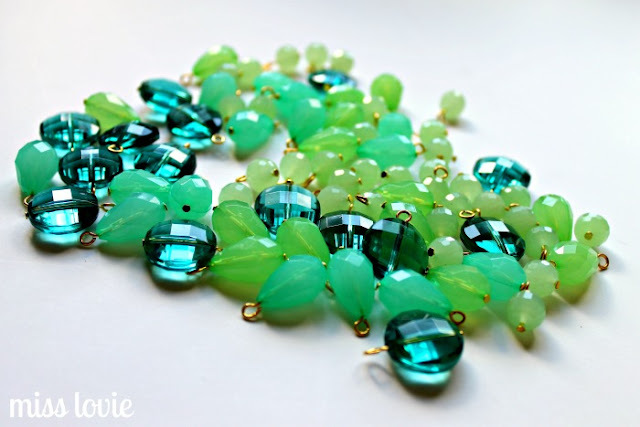 To determine how many links apart each bead should be on each chain just test out what you think looks good and allows the beads to lay correctly and then keep it consistent on that chain. This seems tedious but it makes it look very professional. After you finish the longest chain done, move on to the next chain up. On each chain up, be sure to line up your beads in the "windows" of the beads in the chain below. See how the two beads in the chain above the bottom chain are surrounding the bead on the bottom chain? Start with that and get that right and then build outwards on each chain. Here's the beginning of the last chain. See how all layers line up nicely? I can't wait to wear it soon!! 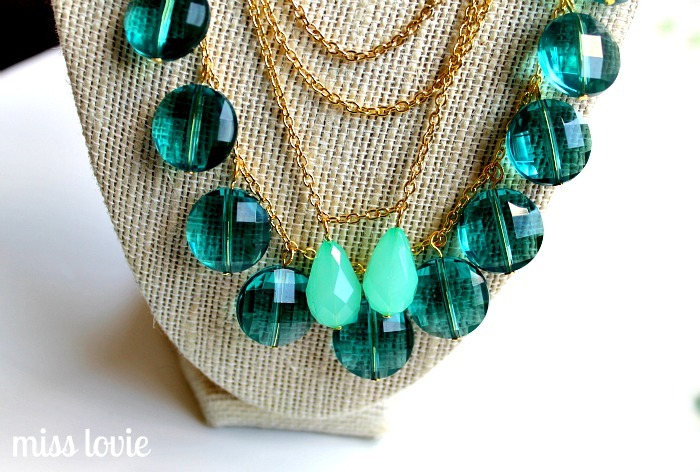 I hope you love this fun Ombre idea! 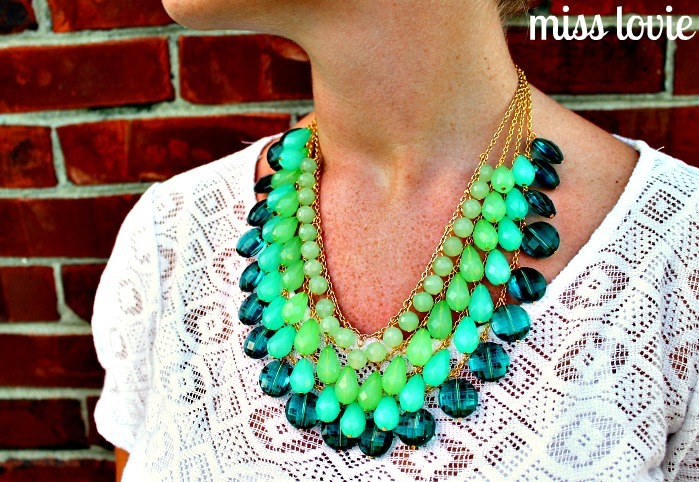 If you missed this project over at So You Think You're Crafty a couple weeks ago, here it is! I didn't write a full tutorial for it, but I do have most pictures and can write one if anyone needs it so just let me know in the comments. You may be able to figure it out pretty well by just looking at the pictures here. It was so funny-I made this and then, literally, the next week saw a version of this same thing in WalMart! Great minds think alike? Mine is prettier, of course. 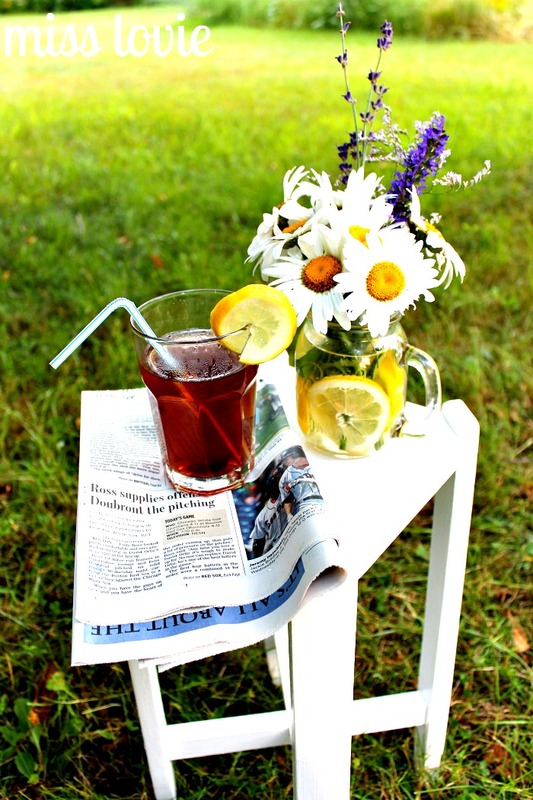 :) :) Enjoy! 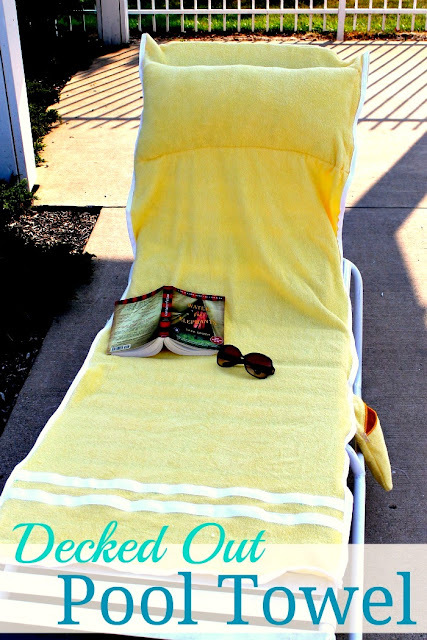 So for the "Summer Bounty" Challenge at So You Think You're Crafty, the first thing that came to mind was sunshine and the pool. 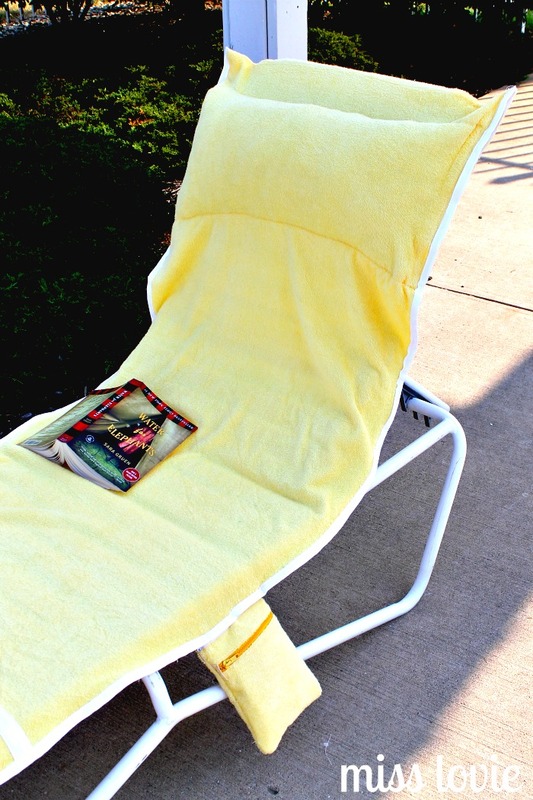 Being in the sun and relaxing while reading my book at the pool is one of my favorite things to do in the summer. Making a pool towel that had some fancy details on it sounded like fun. 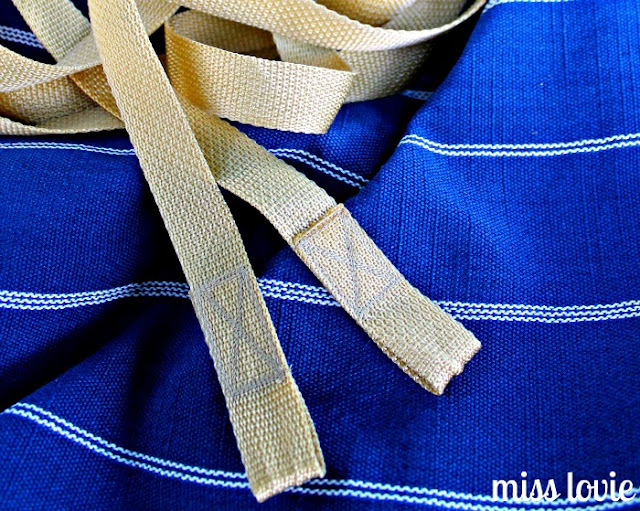 Using terry cloth and cotton twill tape to bind it, I created a pretty easy pool towel. This towel has a removable pillow and a flap that goes over the back of the chair that keeps the towel in place. The pillow is stuffed with shredded foam which should dry quickly and it is sealed inside the little pocket with velcro (the white arrows in the middle picture are pointing to the velcro). 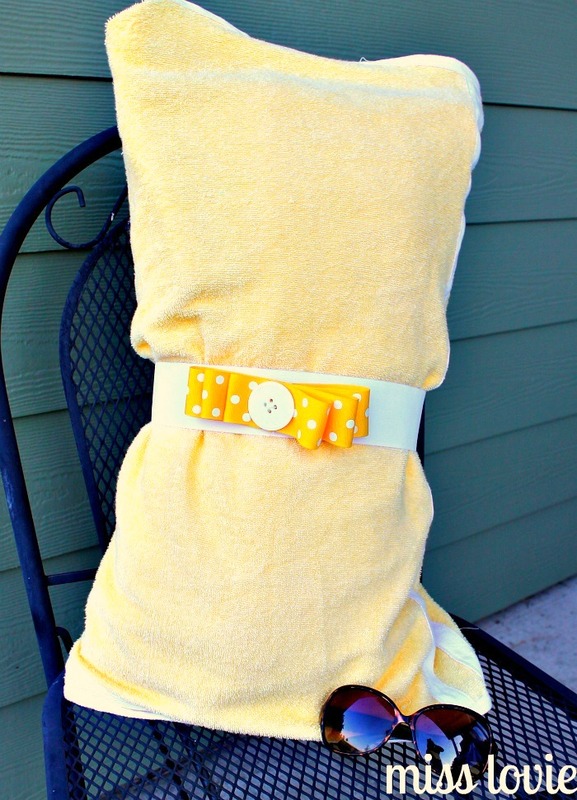 The flap that keeps the towel on the chair is also velcro-d on one side so you can remove the pillow. 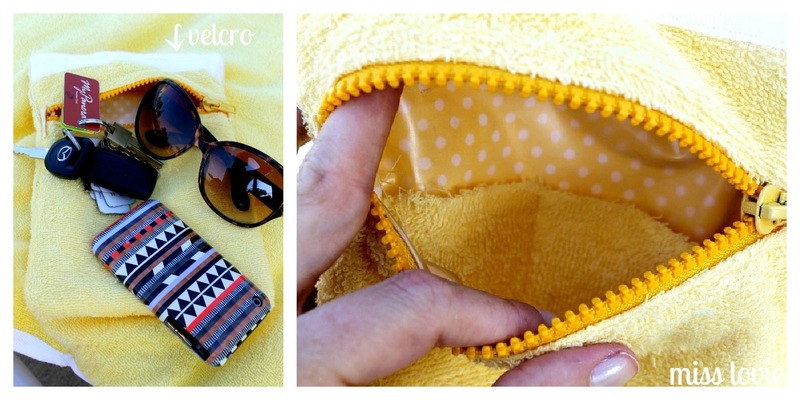 No more digging through your huge pool bag for your phone or keys! The towel also has a removable zipper pouch one one side that can hold your valuables. It has velcro on the top so you can remove it and stick it in your bag so you don't have to keep moving your belongings around. 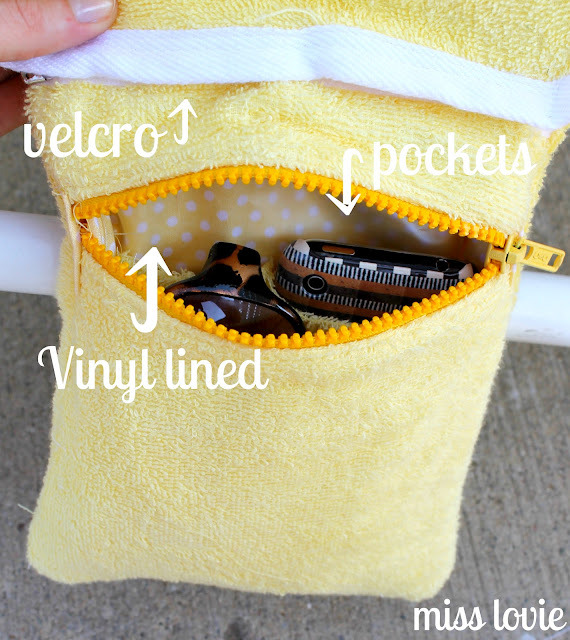 The pouch is lined with vinyl and has a zipper so it is waterproof, as well. There are pockets inside for a phone and sunglasses and extra room in the big pocket for things like keys or a camera. Finally, I sewed a sweet little bow on top of a loop of elastic to slip over the rolled up towel to keep it in place while carrying it. I gave it to a good friend for her birthday and she used it on the beach while we were in Maine visiting her family!! It worked well there, too! I think it's super handy and I know my friend will put it to great use! Hope you like it! Happy Summer! The life of a teacher is so wonderful in the summer. :) I've done lots of great traveling this summer and I'm so happy that I've been able to do that. 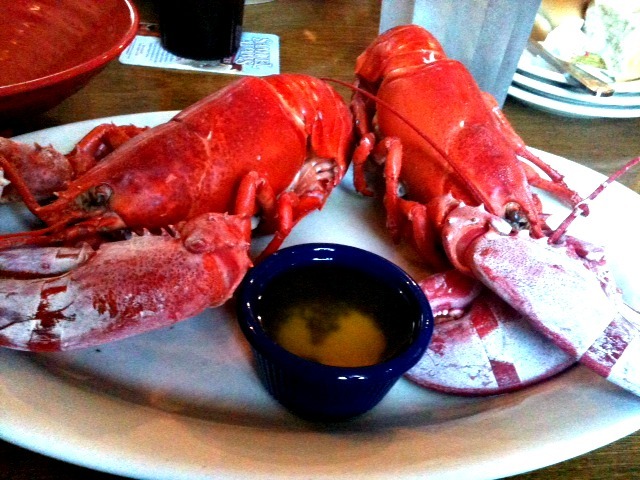 I'm visiting with my good friend Dara's family in Alfred, Maine. We just got here last night. I'm excited for a fun week having new adventures here. 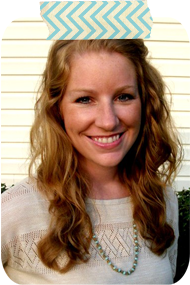 My 30 with 30 outfit post didn't go up last Tuesday because I was getting ready for this trip (sorry!) so I'll have it up next Tuesday (hopefully!) I hope you're having a great week! Oh. My. Goodness. This felt board is so cute. 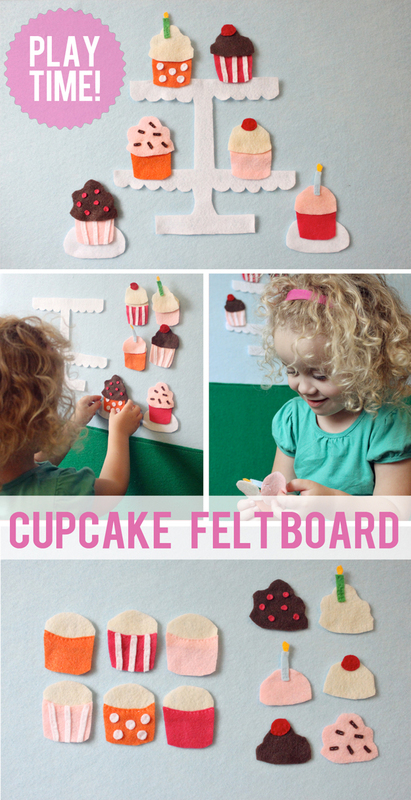 I am a new follower of Natalie's blog because she has so many great felt board ideas!! 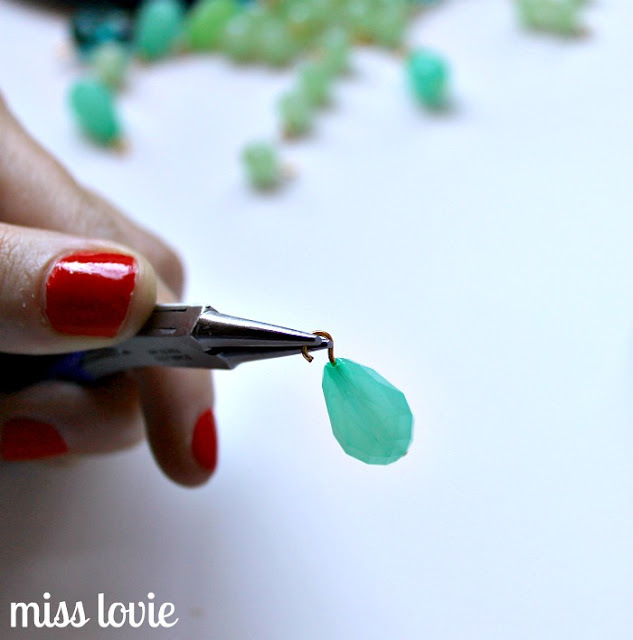 I need more hours in the day so I can make these for my kids at school! This party is beautiful! So girly and such a sweet theme. 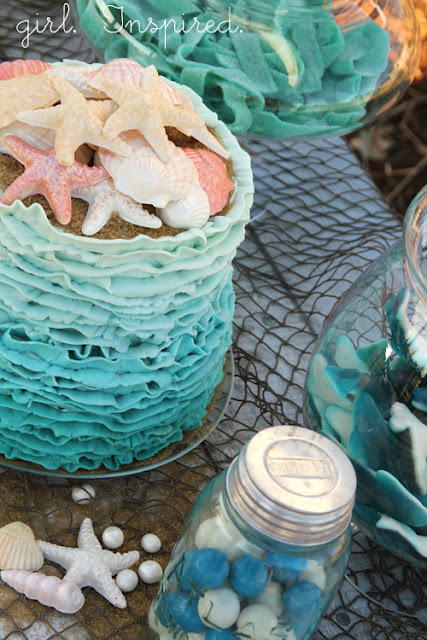 that beach cake is perfect. You have got to go see the rest of the pictures of this one! Oh wow. I love this quilt. 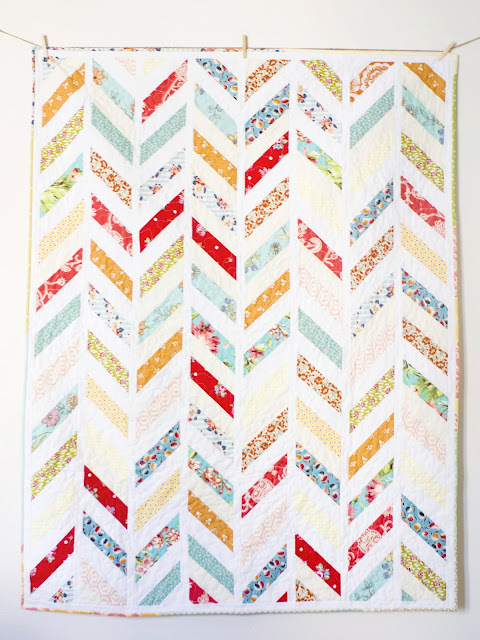 I love the herringbone and the bright colors, especially the oranges, blues, and reds. Amy, come do my kitchen, please. 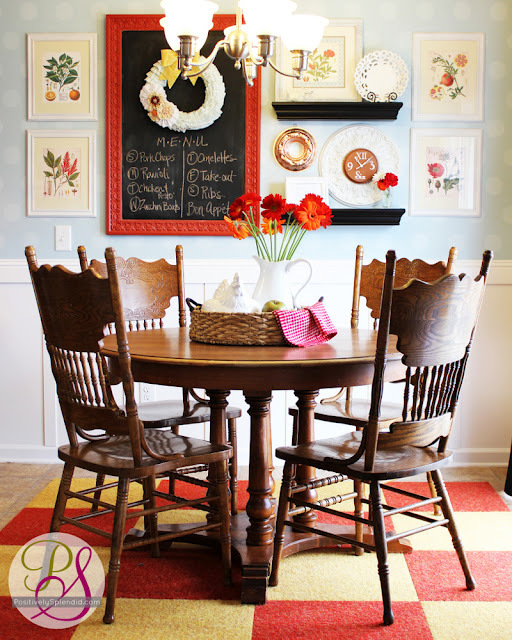 This gorgeous redo made me realize how sad my kitchen/dining area is right now. Seriously, Amy, come on over. 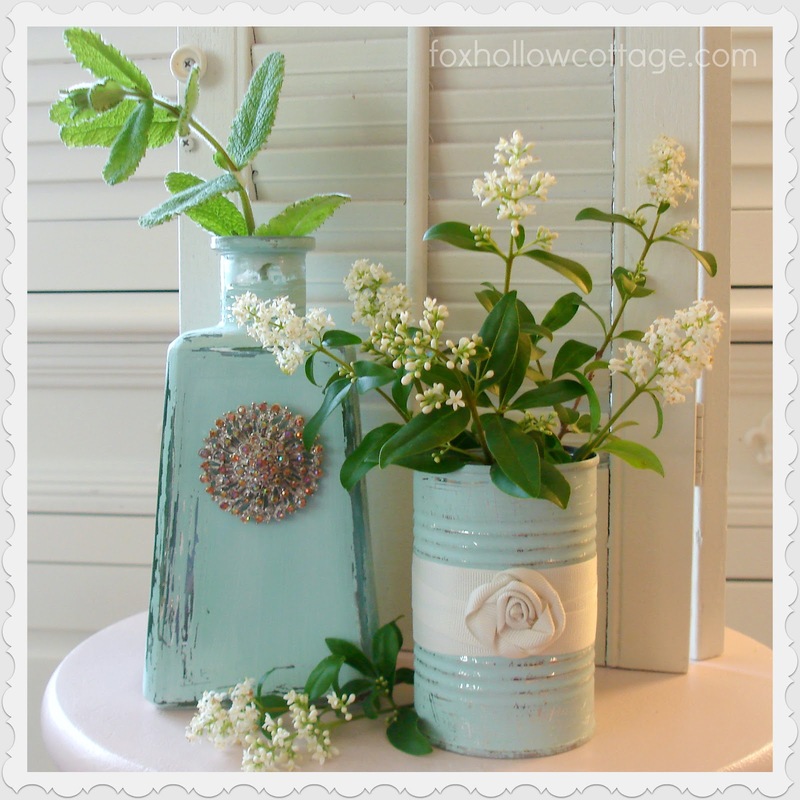 Love the idea of putting a fancy brooch on a fun painted tins. Great idea. AH! 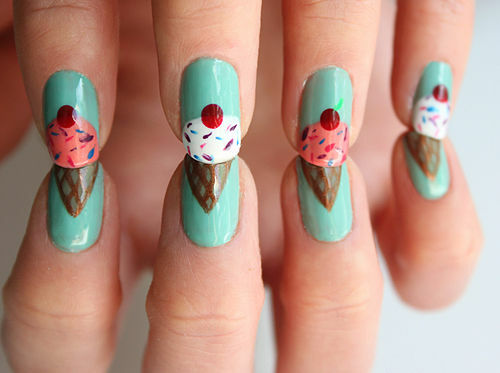 Fun manicures are my new obsession. Karyn Leverenz, this is your fault. LOVE these. 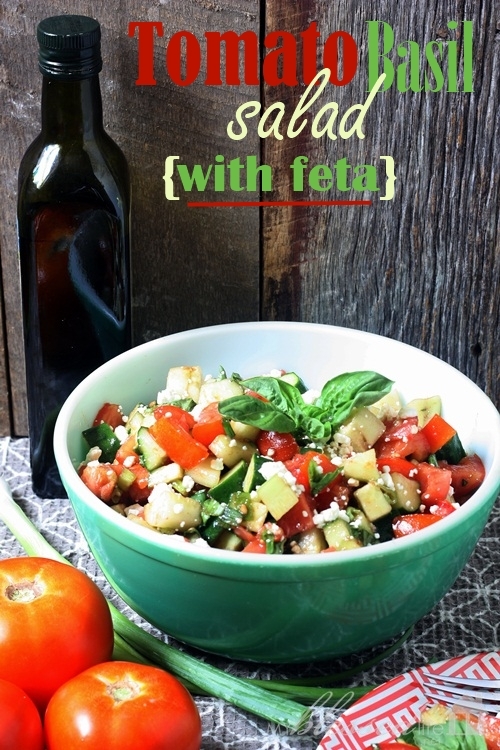 I need this yummy salad this summer. So pretty and delicious looking. If you were featured, I'd love it if you'd grab a button! I hope you enjoyed my favorites from this week!